Week 3 at SLA Beeber: Some nice weather made the thought of soldering circuit boards and decorating sensor housings in the classroom unappealing. We jailbreaked to nearby Indian Creek in Morris Park. 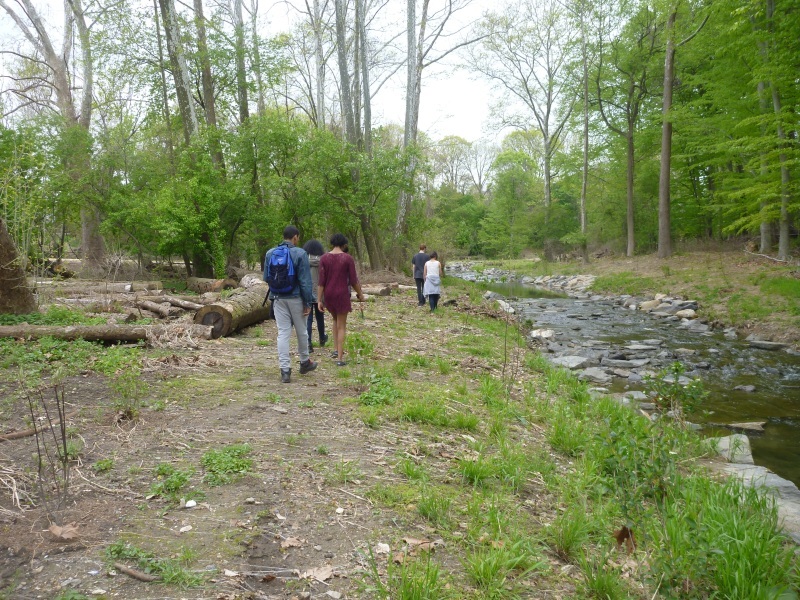 The west branch of the creek was recently daylighted—the creek had been buried in a sewer in 1928, and the Philadelphia Water Department and the U.S. Army Corps of Engineers recently completed the process of bringing the creek back aboveground. Approximately 750 feet of new stream bed was constructed, and 1,300 feet of stream channel was reconfigured. In the photo above, you can see how the new stream features riffles and pools that serve as habitat for fish and aquatic invertebrates. A blog post at phillywatersheds.org has more detail.